Office kitchens, much like in the home, are where people go to fuel their bodies, take a time-out, and recharge depleted energy levels. Why are they so important in an office environment? With so much to offer, practically and emotionally speaking, every workplace – big or small – could make a huge difference to employee morale, productivity, and overall wellness with a few adjustments to their kitchen design. Here’s how. 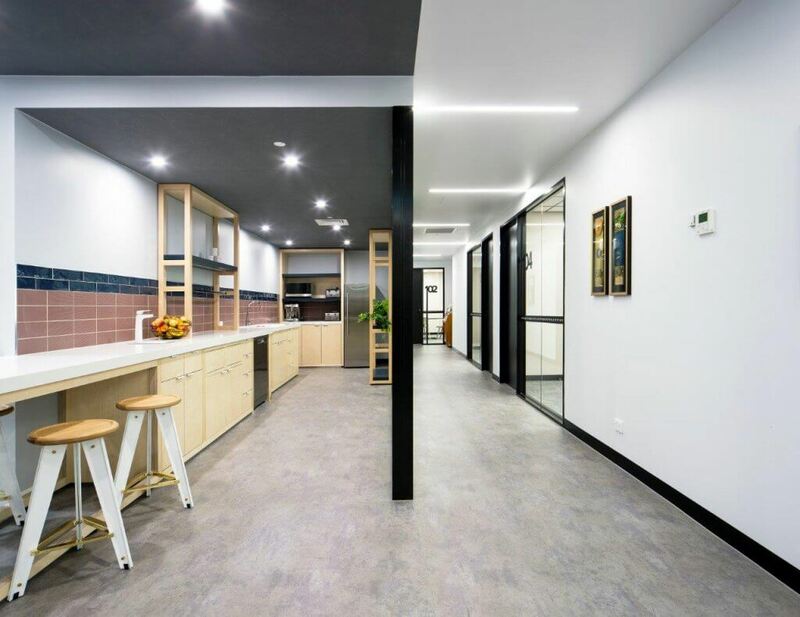 Make the kitchen the lifeblood of your workplace – a warm, inviting space that encourages people to connect, have a chat over a coffee or enjoy a meal together. How do you achieve this? Think about your workforce and the environment best suited to them, and personalise the space. If your staff are on the phones all day and need a quiet place to unwind, the kitchen zone could be that sanctuary. Throw in some herbal tea, soothing lighting, soft music, a relaxing colour palette, comfortable seating, and you’re already halfway there. For staff who need a bit of an energy boost – choose vibrant colours, uplifting music, lots of light, and perhaps a ping-pong table to get the blood pumping and take the atmosphere to a new level. Our point is – if it’s designed with consideration and the right intentions, with your people in mind you will get a lot out of the humble kitchen. Better health, stronger relationships, and a feeling of being valued by their employers. The kitchen facilities can now be used as a formal meeting room or a place for an informal chat, the office kitchen is all about making connections & feeling part of the team. As interior designers, it’s our job to make sure there is sufficient space to move, sit, talk with a group or quietly sit one-on-one. This ensures all personality types are catered for and considered. 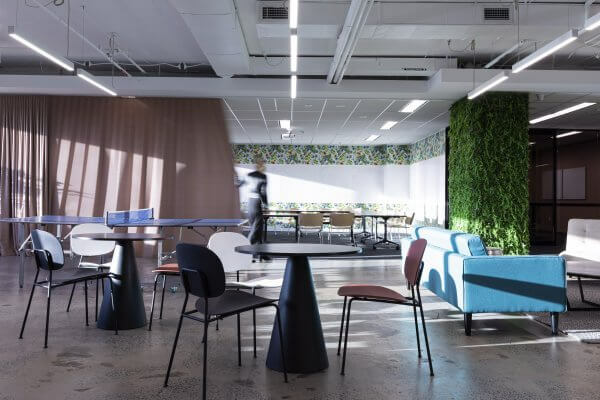 Having a diverse range of seating options is one way of achieving this – consider high stools, soft lounges, booths, Café style seats and tables or perimeter benches. Ensure there is a mix well working in the confines of the space (i.e. no overstuffing), and create the type of environment your staff/people want and need to perform at their best. Breakout zones are used as a meeting room or a retreat, the office kitchen should offer your staff a space to break away from regular operations and switch their minds to something else. By clearly defining the kitchen as it’s own ‘zone’ or a destination, it’s easier for your people to make the transition. You can do this by literally sectioning it off to define borders which helps with minimising the noise to the rest of the office – or by giving the zone a slightly different look and feel. You could make subtle modifications to the colour scheme, furniture, lighting, plants, or background music. Simply providing a fresh fruit basket, books, or board games is enough to indicate to staff that they have entered a different environment, where communication and creativity is encouraged. Health, well-being, and motivation are the best reasons to rethink your office kitchen design. It doesn’t have to be an expensive exercise to make a difference, just as long as it’s done with your people in mind. Staff are spending more and more time indoors and the heart of the kitchen allows people to feel home away from home. Design the heart of the office, with heart.